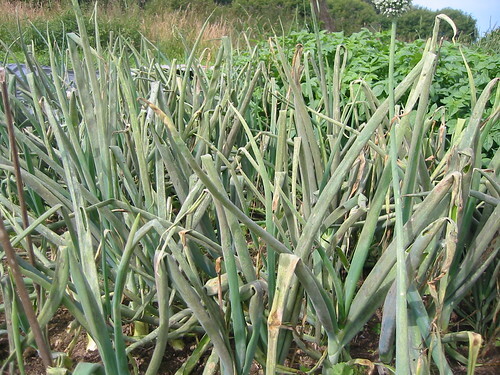 This is what happens to onions when they suffer an uncontrolled attack of downy mildew. 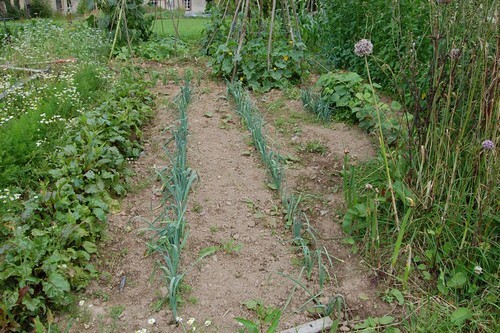 I've been so caught up in worrying about blight on the tomatoes and potatoes it never occurred to me that I should be worrying about the onions as well. They look even worse now than when I took this picture a week ago and the whole crop is toast. With hindsight, it's partly my fault. I had them a little bit too close together and the shelter provided by the huge hedge of potato foliage behind them created just the right micro climate for the fungus to get a hold. We'll probably be able to use a few of the onions when they've dried off but they won't keep well and will need to be kept away from any seed bulbs being saved for next year. 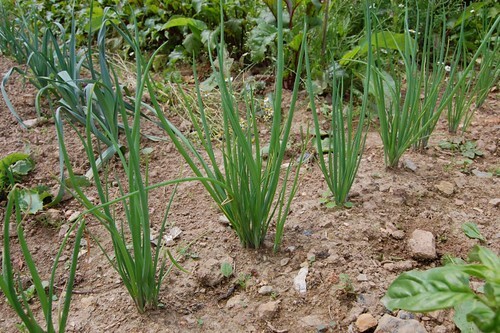 These are the shallots that were growing next to the onions. Because they were started late they're not very big, and they also had a dose of mildew so I won't be saving any for next year's planting although one or two of the best ones look as if they have some potential. I bought these from a garden centre in the UK this spring but they aren't a traditional variety although I forget what they were called. They were probably seed raised as you might guess from the flowering heads of one of the groups. 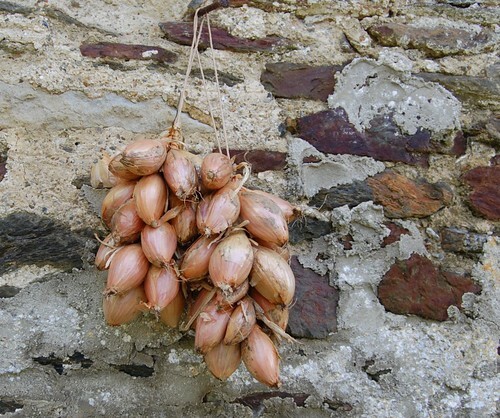 Good shallots don't waste energy on seed. 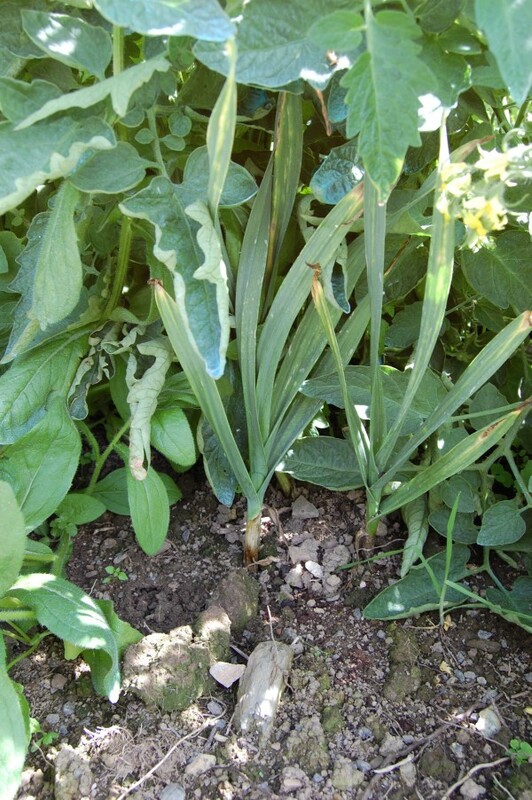 As mentioned, I bought my leek seedlings a few weeks ago and planted them out. Because they're in the ground for such a long time I always have problems keeping them weeded. This year my strategy is to plant them closely together in wide spaced rows to make it easier to get in with a hoe. This may make it difficult to protect them from the deer later in the year. Another no win situation. 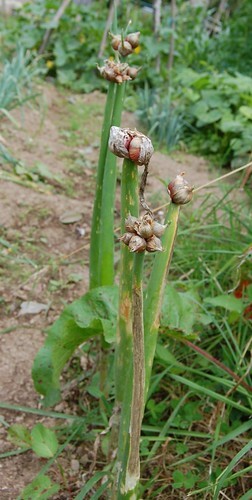 The egyptian walking onions have had a hard year fighting with the weeds but have formed their heads quite well. They are a funny novelty onion and although I've grown them many times I've probably never used them in any sort of cooking, we just look at them and marvel. Apparently there are varieties even within the subspecies but I've never seen any particularly distinctive ones, well no more distinctive than they are already. 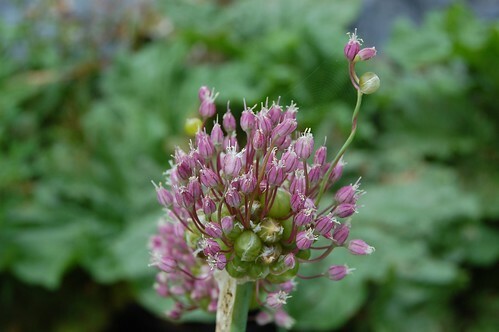 Babington leeks, wilder but closely related to the elephant garlic also produce bulbils on their flowering heads. 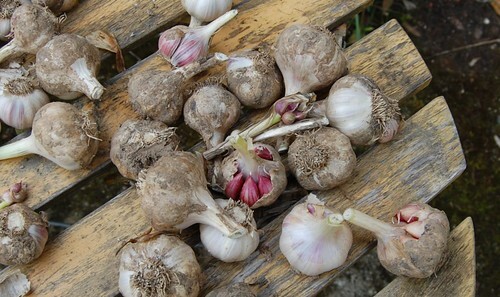 These are a good means of propagation as the underground bulbs are slow to divide and multiply. When the flowers come the leafy parts almost disappear but will sprout again over the winter to form new clumps the following spring. Seedling welsh onions. These are seeds from Realseeds, but they don't seem to be listed this year and I can't remember the name which was something like 'somebody's' selected. They are doing quite well if a little slowly and seem to have avoided the mildew for the time being. 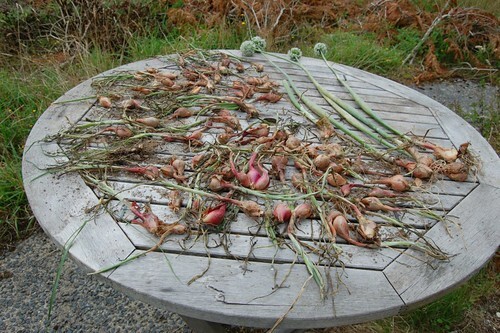 These are the good shallots, grown in a different part of the garden to the other shallots and onion sets. The variety is a French one, that's all I can tell you. Maybe I should start being a bit more organised. I have 20 of these put aside for planting next spring. Garlic, never quite as magnificent a crop as I would like. These were late planted in the first week of March this year and have done well considering that. The variety or varieties is unknown because they were supermarket sourced but I particularly like the crimson red skin on some of them. I find it hard to understand some of the hyperbole spouted about different garlic varieties and their taste and cooking characteristics. There are, in my opinion at the moment, hard necked and soft necked types in a variety of skin colours but they all taste of garlic and like most other plants the quality comes down to how well adapted they are to the local growing conditions. Anyway, in the spirit of science, I hope to put some of this to the test in the next growing season by selecting some particularly toothsome sounding cultivars and growing them on for a taste test next summer. I also want to get a stock of soft necked garlic in hand because they plait and I do love a garlic plait but I'll keep a few of these pretty crimson hardnecks as the control. Finally the elephant garlic, swamped by tomatoes. I think it will be o.k. It was late going in and I don't expect it to do much more than make single bulbs this year which should produce good sized bulbs of cloves next year. Must go and tie up those toms.